George loves going on adventures and exploring new places. Whether he's enjoying the excitement of the amusement park or the yummy comforts of Chef Pisghetti's restaurant, there's always so much to see and do. Can you help George find the hidden items pictured on each page? 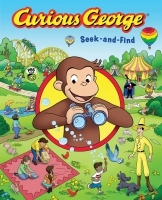 For more seeking and searching fun, don't forget to look for George's friends, too. From under the sea to outer space, join Curious George as he searches for hidden items this seek-and-find adventure based on the Emmy Award-winning TV series.